Shadow - Applies a very faint shadow to your text. You can change a lot of the font atrributes using the (Format > Font) dialog box. Shadow - Adding shadows behind your text can make it stand out from its background. Many of the standard templates use shadows. You can also use the "Shadow Style" button on the Drawing toolbar to apply shadows to the whole textbox. You can change your text to superscript and subscript using the (Format > Font) dialog box. A superscripted lowercase "o" is a great substitute for the degrees symbol. PowerPoint has a handy feature that lets you replace all occurrences of one font and replace them with another font. 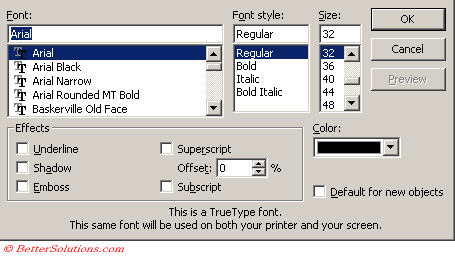 Select (Format > Replace Fonts). Select the font you want to replace in the Replace drop-down box and choose the font you want to replace it with in the With drop-down box. When you have finished replacing all the necessary fonts press Close to close the dialog box. To be safe always embed True Type fonts ?? To copy over a style associated with a picture / object select the picture, Choose format > PickUp object style. Click your unformatted object ans select Format > Apply Object Style. You can also use the format painter.